South America is an important emerging market with domestic demand for PET growing at around 5%. Today’s per capita consumption of PET is comparatively low at 2.8 kg and has great potential for growth. M&G’s bankruptcy has caused temporary market disruption as well as opportunities to major players through acquisitions of its assets to provide in-roads into North and South America! Are mergers & acquisitions driving new growth? “Far Eastern New Century Corporation has successfully bid around $33.5 million for a PET plant in West Virginia and a research center in Ohio in the U.S. formerly owned by M&G Polymers USA LLC in Apple Grove”. With the new acquisitions, will more new grades be offered to the South and Central America (SCA) markets? With growing affluence and changing lifestyle, demand for on-the-go food and smaller packaging are driving PET packaging innovations. Hear from leading converters and brand-owners what is the new packaging trends in the new 5 years. Sustainable packaging is a megatrend sweeping the world over. There is mounting pressure on brand owners and retailers to reduce the environmental impact of their packaging, including light-weighting, increased used of recycled plastics or bioplastics. Find out from local brand-owners what is their sustainable packaging strategy towards a circular economy and how RPET is contributing to their packaging commitment and what are the potential alternatives to PET? Increasingly more PET recycling facilities are being set up in SCA to meet the growing demand of brand-owners like Coca-Cola, Villavicencio in Argentina, Postobon in Colombia and RainForest in Costa Rica! PET recycling & applications in Honduras and is Brazil catching up on post consumer PET recycling? Register with your team at www.cmtevents.com to enjoy group discount! Transformadores, usuarios finales, recicladores y empresas dedicadas al PET de Sudamérica y Centroamérica se dan cita en la sexta edición de SCAPET en Cartagena. Las tendencias, los desarrollos, las nuevas aplicaciones y los proyectos de reciclaje en el mercado PET de alto crecimiento de Sudamérica y Centroamérica son puntos destacados en la sexta edición del encuentro SCAPET en Cartagena que se celebrará entre el 12 y el 13 de junio de 2018. CARTAGENA, Colombia, 24 de abril de 2018 /PRNewswire/ -- La sexta edición de la cumbre SCAPET de Centre for Management Technology, (CMT) — foro de intercambio anual para los titulares de marcas, los transformadores y los recicladores — armó un impresionante elenco de temas y oradores para su edición de 2018. Este elenco incluye presentaciones sobre las tendencias PET y RPET hasta 2024 por Fernando Rosas, Director comercial de Resinas de Alpek Polyester, y Dinis Mota, Director ejecutivo de Coexpan, que tratarán sobre el tema de "Perspectivas de crecimiento de los Productos Termoformados PET en Sudamérica y Centroamérica". La participación de los usuarios finales incluye a la directora de Sostenibilidad de Postobon, Martha Ruby Falla, que hablará sobre "Compromiso y reciclaje sostenible" con el foco en el embalaje sostenible, una visión de reciclaje y planes de acción, más Fabián Leonardo Jaimes Pacheco, titular de Ingeniería de Embalaje de Quala, que presentará una exposición titulada "Trabajar con proveedores para lograr innovaciones de embalaje". Enka de Colombia también hablará sobre el tema "Moda sostenible de RPET", mientras que Global PET Reciclagem responderá a la pregunta "¿Brasil se está poniendo al día con el reciclaje PET postconsumidor? ", oportunidad en la que compartirá novedades sobre la economía y la infraestructura de recolección de RPET en Brasil. La sesión de Invema sobre "Reciclaje y aplicaciones PET en Honduras" tratará sobre su nueva planta de reciclaje de botellas PET y las historias de éxito de Honduras al haber logrado una alta tasa de reciclaje PET. Estos son algunos de los demás temas principales: Nexant hablará sobre "Dinámica cambiante en la cadena de valor PET de Sudamérica", exposición en la que se analizarán los flujos comerciales y las perspectivas de la oferta y la demanda de PX/PTA/MEG y PET; Euromonitor presentará "Oportunidades de crecimiento y tendencias fundamentales en el embalaje PET de comidas y bebidas"; y Bonset Latin America ofrecerá información estratégica sobre "Perspectivas, innovaciones y aplicaciones emergentes del mercado del film retráctil PETG en Sudamérica". Husky Injection Molding Systems se incorpora como Silver Sponsor y presentará una exposición sobre "De qué manera la tecnología multicapa permite el crecimiento en embalaje PET", mientras que Viscotec como Networking Sponsor de la cumbre. Visite el sitio web de la sexta edición de SCAPET para obtener más información. Para hacer consultas en inglés, contacte a Grace Oh escribiendo a grace@cmtsp.com.sg o llamando al +65 6346 9147. Para hacer consultas en español, contacte a Tanya Tardan escribiendo a tanya@cmtsp.com.sg o llamando al +52 55 56352672. 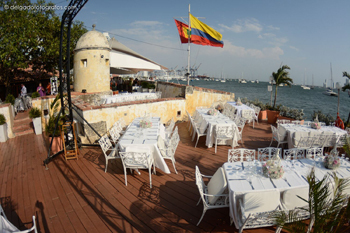 Club de Pesca is a symbol of identity that characterizes the city of Cartagena de Indias. Founded in 1956, it is one of the most traditional and famous club in the city. Its historical and marine environment is characterized by its location within the Bay of Cartagena. San Sebastian del Pastelillo Fort, built in 1743 to defend the city is the ancient setting ground for this magnificent club which evokes the magic, history, freshness and warmth of the city of Cartagena, with an atmosphere of fresh, natural and welcoming air. Este evento es una excelente plataforma para promocionar su organización a dueños e inversionistas influyentes en la industria. ¡Hable con nosotros sobre paquetes de patrocinio o reserve su espacio de exhibición ahora! Coexpan-Emsur Brasil - is formed by marrying Grupo Lantero’s two divisions - Coexpan and Emsur under a ‘one-stop shop’ concept. Coexpan-Emsur Brasil has now begun operations and is producing combined rigid and flexible packaging products. The products are targeted for Brazil and South American food industries. Located in Jundiaí, Sao Paulo, the Coexpan-Emsur Brasil production plant is about 7,000 sqm. The company plans to double the capacity for future needs. The plant is capable of producing both rigid and flexible packaging, including PS and PP extruded barrier sheets for FFS, rotogravure printing for labels, and lids with hot melt application in line, as well as sleeve capabilities. Grupo Lantero has taken one step further forward in its ‘Horizon 2020’ strategic plan with the establishment of Coexpan-Emsur Brasil. It aims to become a leading global player in the food plastic packaging market in Europe and America. While Coexpan manufactures rigid plastic sheets and thermoformed products, Emsur produces flexible containers. Coexpan’s plants are in Mexico, Brazil and Chile and they serve the American market. Emsur, on the other hand, has 10 production plants including those in Chicago, New York, Mexico and Argentina and its products are used across Americas, Europe, Africa, the Middle East and Asia. Dinis Mota, CEO of Coexpan presents on 'PET Thermoformed Products Growth Prospect In South & Central America' at CMT's 6th SCAPET on 12-13 June, 2018 in Cartagena, Colombia. Contact Grace Oh at grace@cmtsp.com.sg or call +65 6346 9147 for more information. Brazil’s PET resins producer – M&G Polimeros Brazil will be acquired by Thailand-based Indorama Ventures. The deal that was finalised in March this year, is expected to be completed in Q2, once all approvals are secured. M&G Polimeros Brazil is the largest PET facility in Brazil with a capacity of 550,000 tonnes of PET resins per year. By acquiring this plant, Indorama can increase its footprint in the South American market – that the company says is “an important emerging market with domestic demand for PET increasing at about 5%”. The facility in Brazil will also benefit from Indorama being a key PTA producer – which is a key feedstock in PET resin production. Last year, Indorama ventures announced to acquire DuPont Teijin Films (DTF), that produces biaxially-oriented Polyethylene Terephthalate (BOPET) and Polyethylene Naphthalate (PEN) films used in specialty, packaging, industrial, automotive, advanced magnetic media, photo systems, electrical and electronics markets. Know more about South/Central America & Caribbean PET markets at 6th SCAPET on 12-13 June, 2018 in Cartagena, Colombia. Braskem, Americas’ largest producer of thermoplastic resins, estimates that global demand for monoethylene glycol (MEG) – a key ingredient in PET production – will be between 25 to 30 million tonnes per year, with 85% going into PET production. Meanwhile as companies are more keen on sustainable solutions, some buyers are looking at biobased or green plastics to achieve carbon emission targets. As such the demand for green plastics is expected to manifold in the coming years. Braskem – that already has a plant in Brazil that produces green plastic from sugar cane, is now planning to venture into sugar based MEG production. The company has collaborated with Denmark’s Haldor Topsoe to experiment the use of sugar to produce MEG. Already there are few instances where MEG is produced from renewable sources such as ethanol. Braskem is confident that its research could reach better industrial yields to produce MEG from sugar compared to ethanol. The pilot project to test the use of sugar to produce MEG will be located in Denmark – which is expected to start operations in 2019. Braskem wants to keep a flexible system in the pilot. Initially cane sugar will be used, but they are also open to using other sources such as beet sugar or even second generation sugar, made from biomass. Based on the pilot project and financial feasibility, Braskem expects to build a large sugar based MEG plant by 2020 or 2021. More about green plastics, PET and MEG production at CMT’s 6th SCAPET on 12-13 June in Cartagena, Colombia.